I don't know about you but I already have the Holidays on my mind. Halloween is practically here and I am already scouting out the latest and greatest ( and worth while ) Christmas gift ideas for our kids. As you may know from a press release in April, there will be a NEW Skylanders game coming out in October 5, 2014, Skylanders Trap Team. I am crossing my fingers and toes that I will get the chance to review this for you guys before it hits the shelves. But in the meanwhile I am here to share with you some super cool ultra exclusive news. During the special “Skylanders: The Creative Process of Bringing Toys to Life” panel at San Diego Comic-Con on July 25, 2014, the best-selling kid’s toy/game franchise announced the new premium toy line “Eon’s Elite” that will launch this fall. 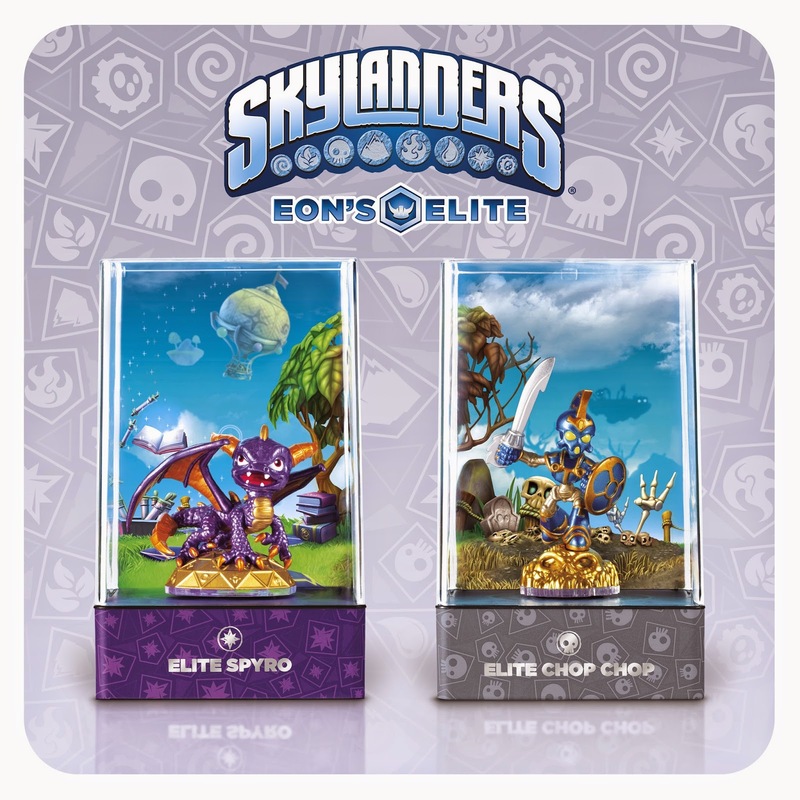 The limited edition Eon’s Elite will introduce eight must-have collectible versions of fan-favorite Skylanders characters, beginning with Spyro and Chop Chop. I have a soft spot for Spyro, he is my personal favorite. I used to play the original 'Spyro' game on my little gray Playstation console after school everyday. Did you play video games growing up ? Both of my kids, especially my son, are Skylanders super fans. I my son has finished all three games like ... five times and he is only 5 ( almost 6 now) years old. I think I've told you guys before how he has begged me to let him make his own blog and YouTube account. So he could share his gaming and regular you playing tips with other kids ? He cracks me up ! Anyways back to the subject, these Eon’s Elite characters will feature never-before-seen decoration. With a distinct, metallic finish and a golden base that sets them apart from other Skylanders toys. Each of these special edition toys will be offered in premium foil packaging and also features a display case with a 3D lenticular background. Additionally, when played in-game, Eon’s Elite will be up to three times as powerful over other characters, which represents the biggest in-game boosts ever incorporated into a Skylanders toy to date. Are these Premium Eon’s Elite characters & Skylanders Trap Team on your Holiday shopping list ? Be the FIRST to share this news with your friends through the share buttons below ! the kids love skylanders and will love the new toys and games that are coming out. i just have to ease them into it because they will want them all at once if i don't. Sounds like a ton of fun for video-game loving little boys! My nephew would love these! Thanks for the heads up!